Waltham watch company is a brand many people have heard of, likely not anytime recently, though. That is all about to change. Antonio DiBenedetto, who purchased the majority stake of Waltham SA in 2011, is about to re-launch the brand stateside. Waltham was founded in 1850 by Aaron Lufkin Dennison in Roxbury, Massachusetts. According to Waltham, the then American brand, was the first industrial mechanical watch and clock manufacturer in the world. The veracity of any claim in the watch industry, is almost always debatable, depending who you talk to. In this case, it is safe to say Waltham was a pioneer in using interchangeable parts, automating the watch production process and producing watches in series. They produced over 40 million timepieces (from 1850-1957). In 1954, after more than 100 years in US, they established Waltham SA in Switzerland. And eventually, they were bought by a Japanese firm in 1981. From then until the present, the brand name has been virtually non-existent, except in Japan. It is a shame, as they have a rich watchmaking history, producing everything from making marine chronometers to military timepieces to instruments in airplanes. 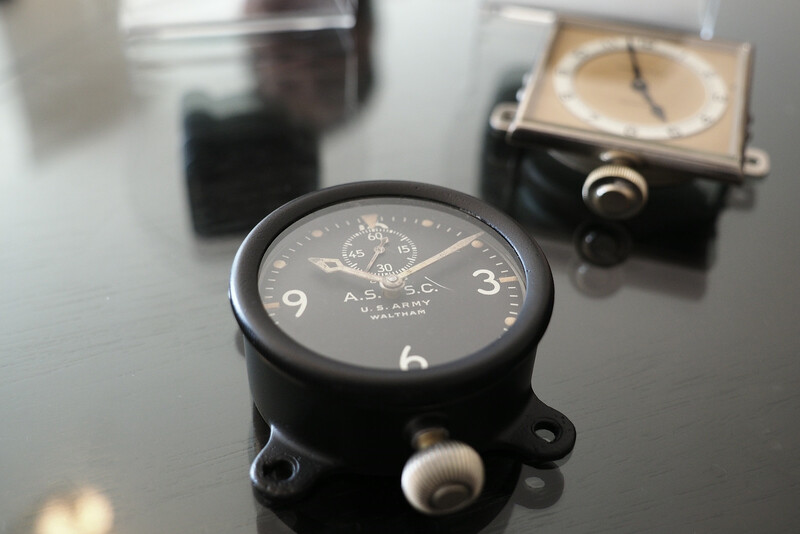 This past week, at a suite in the New York Palace hotel in Midtown, Waltham SA gave PROFESSIONAL WATCHES a preview of their soon to be launched Waltham Aeronaval XA line. The collection consists of two models, with three variations each, for a total of 6 brand new models. They will initially launch in the US market, beginning with Cellini Jewelers in NYC, with an eventual roll out to a select number of key US retailers. From there, they will launch in the Swiss market, and then around the world. In speaking with DiBenedetto, he said that instead of designing historical models, they wanted to do a modern interpretation of Waltham. And so the two models have inspiration from historic timepieces, but with distinctive, completely modern styling. The first model we will show you — and which we teased last week — is the Aeronaval XA Solo Tempo. It is presented in a grade 5 titanium case that measures 47 mm at on back, and 44 mm on the front. The bezel is made of ceramic, with a matt finish. The case is very angular, with a sporty feel. The lugs are ergonomic, and despite its substantial size, it feels comfortable on the wrist. The dial has an embossed black W pattern with applied indexes (on the outer chapter ring) and Arabic numerals at 3, 6 and 9 (on the inner chapter ring), all of which have been coated with a generous Superluminova treatment. “Swiss Made” is printed on the outer chapter ring at 6 o’clock. Oversized hands, reminiscent of the vintage Waltham XA 37, indicate hours and minutes. The flange has a printed 0-60 scale. The most distinctive element of the XA, derived from the original XA 37, is a small seconds display at 12 o’clock. This feature required Dubois-Dépraz to re-work their W.DB-001 14060 caliber for Waltham. The automatic movement beats at 4Hz, has 29 jewels and a maximum power reserve of 44-hours. The caseback, which has more of rectangle than a circular shape, is solid and is screwed down. It is engraved with an individual number for each watch, and the number can be entered online for warranty and reference. The crown is screwed down crown, which combined with a thick gasket sealed sapphire and solid caseback, allows for 300 meter water-resistant. The Waltham XA comes in titanium (Pure, Ref. W.DB-001.1), bi-colored titanium/PVD (Eclipse, Ref. W.DB-001.2), and all black titanium PVD (Black Matter, Ref. W.DB-001.3). Each piece is paired with a Vulcanised VulCarboné® genuine rubber, non-allergenic strap, reinforced with Nomex®; with a titanium grade 2 deployante buckle. 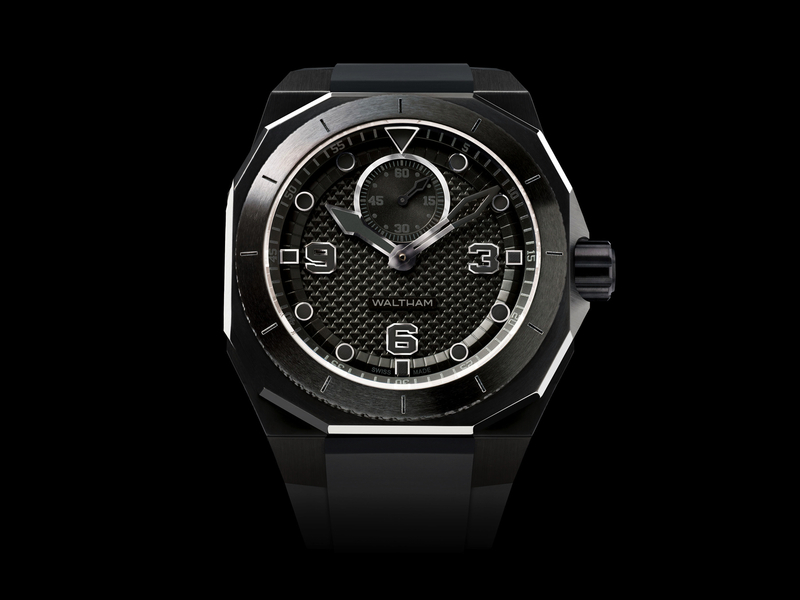 The price is $5,500 in titanium, $5,700 in titanium/PVD and $5,700 in all black titanium PVD. Every Waltham comes with a 5-year warranty. Visit the Waltham website. As we mentioned above, there is also a second model due at launch. Check back later this week for the follow up post on the Waltham XA CDI.